One of the first quilts I ever made was a king size lone star quilt. In hindsight, starting my quilting journey with a king size was probably not the best idea, and my quilting aesthetic has changed significantly since the. However; this is still one of my favorite quilts. So when I was asked to visit the Indiana State Museum’s exhibit “19 Stars: Quilts of Indiana’s Past and Present” I was very excited. 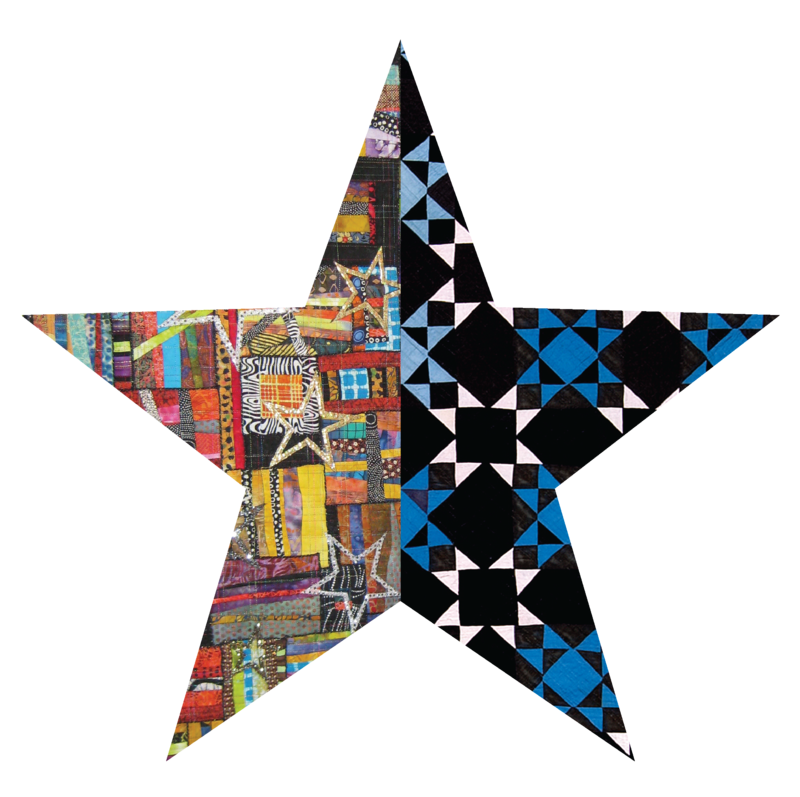 The exhibit is in celebration of Indiana’s bicentenial and features a mixed collection of 38 historic and contemporary examples of star-themed quilts. Indiana was the 19th state to join the Union and there are 19 stars on the Indiana State flag. The quilts are from the museum’s collection as well as loans from some of Indiana’s best quilt artists. The majority of contemporary quilts were created specifically for the exhibit, which fills two galleries on Level 3 of the museum. After walking through both galleries, I was surprised to find I was more drawn to the “traditional” quilts. Overall they seemed more “modern” to me. I especially loved this tied quilt, and the way a couple of the quilts had embroidered labels on the fronts, as opposed to the backs. I will be sure to try and add these touches to a few of my quilts in the future. All of the quilts were beautiful, and I would highly recommend that everyone check it out. The Indiana State Museum is located at 650 W. Washington Street in Indianapolis. Exhibition gallery hours are 10 a.m. to 5 p.m. Monday through Saturday and 11 a.m. to 5 p.m. on Sunday. The first Tuesday of each month (Community Tuesdays) admission is half price. Auxiliary aids and services are available with advance notice. For more information, call the museum at 317.232.1637. For ticket information, please visit indianamuseum.org. It’s been awhile since I last posted, but I think I was just waiting for the perfect inspiration. I am so excited to share with everyone a couple of projects I made for Heather Givans of Crimson Tate for her new fabric collection Succulents for Windham Fabrics. 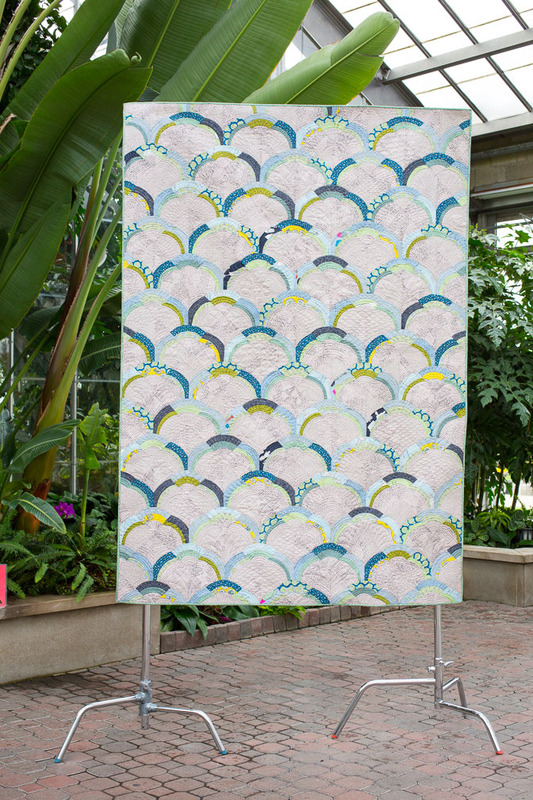 Last year Heather told us she would be showing her very first fabric collection at the October 2014 Quilt Market, and she asked if anyone would help make projects for her to display in her booth. Of course I jumped at the opportunity to sew with her beautiful fabrics, and help out a very sweet friend. For my project I offered to sew up a pretty dress. Heather picked out this beautiful gray and green print. I think her Succulents fabrics lend themselves very well to garment sewing, especially this tiny plant print that has an almost vintage feel when sewn up as a dress or skirt. The pattern I chose was the Myrtle Dress from Colette Patterns. 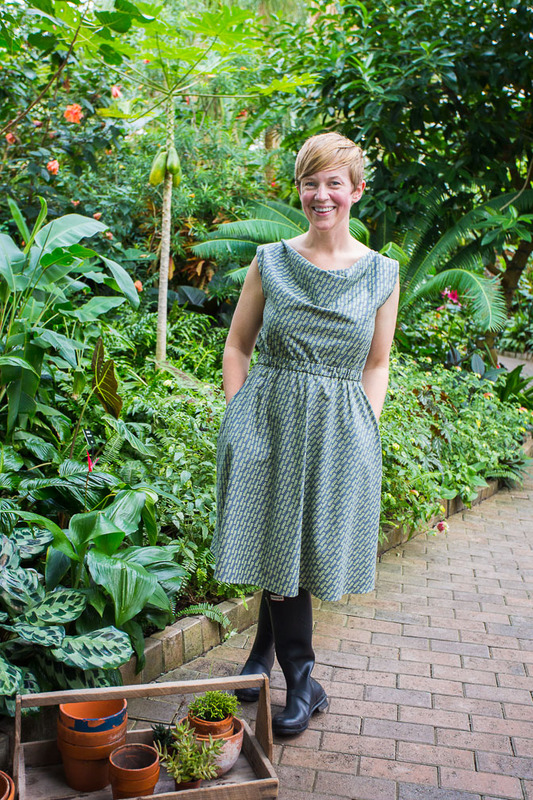 The pattern is written for knits, but Sarai has a great tutorial on sewing it up with wovens. The simple pattern is perfect for people new to garment sewing. It has a relaxed draped neckline, elastic waist, and (my personal favorite) pockets! This great dress works in the cool spring weather with a pair of tights and boots, and can take you into hot summer days with its sleeveless style. Our lucky friend Brook was selected as a model for Heathers look book, and her friend Eric did an amazing job taking these great photos! Now that Quilt Market has come and gone, I picked up some of this beautiful border print from her collection. It is also a perfect print for garment sewing, so I decided to make a quick wrap skirt using another Colette Pattern, the Osaka Skirt, from her online publication Seamwork. March 21: Meghan Eschbaugh of Calvin and Carolyn You are Here! Be sure to keep an eye on that Heather Givans, I anticipate many more amazing fabrics to come! And one more photo of the Succulent Path quilt by Sarah, because I absolutely love it (and I had a blast helping her make these blocks). I have one more entry for this years Bloggers Quilt Festival. This quilt I am entering into the large quilts category. I posted about this quilt a couple of times last year (here, and here) if you are interested in the process of how this quilt was made. It was quite a labor of love. It is finally done, and I have to say I am so Happy with the result. I finished it by quilting a heart in the area of our home town, Muskegon, MI, (by hand) then echoed the heart out across the state. The quilting in the areas of the lakes is simple wavey horizontal lines. I suppose now I need to make a map quilt of the Upper Peninsula of Michigan as an homage to my alma mater Michigan Technological University (Go Huskies!). Now, no matter where we roam, we will have a little piece of home to take with us and keep us warm. While everyone is busy with Quilt Market, this spring has turned into the spring of challenge quilts. First up for consideration is my quilt for this year’s Umbrella Prints Trimmings Competition, as well as my entry for this year’s Bloggers Quilt Festival in the small quilt category. Please be sure to visit the Umbrella Prints Pinterest board starting June 1st to pin my quilt, and visit the Bloggers Quilt Festival page to vote for me! Umbrella Prints is an Australian textile company, started in 2006, specializing in organic printed fabrics. I really love their fabrics, but I also love their environmentally friendly practices. Their annual trimmings competition, now in its 5th year, is a design challenge that forces you to look at a “waste” product (fabric scraps) with new eyes. Here is how it works, you buy a small packet of “trimmings” and make anything you want. It can be mixed media, apparel, home décor…anything. You post a picture of it on-line and send a link to your photo to Umbrella Prints. They pin your photo to their Pinterest board for this year and the voting begins (June 1st). There are prizes for a Judges award as well as a Pinners Choice award. This year they have also added a special Quilters category. How could I not throw my hat in the ring? I bought a pack of their blue trimmings. To finish out my quilt I paired them with some hand screen printed trimmings from my friend Stefanie at 1606 and some solids in neutral tones with a pop of bright coral. The design was inspired by all the lovely southwest prints that I have seen around this season. And the triangles were improvisationally pieced. For the back I chose a light turquoise blue, and the quilting thread is a pale coral. The quilting is predominantly stitch in the ditch, but I also added some triangle quilting to make the small triangle trimmings pop a little. And to finish it all out it is bound in the same coral fabric from the front. After a trip through the wash it crinkled up so nicely. I really love how this quilt turned out. It feels more like art to me than just a baby quilt. Although I’m sure it will be great for snuggling too. Along with Selfish Sewing Week and the Spring Top Sew Along I wrote about last week comes Me Made May from Zoe at So Zo What do ya know? I think it is an excellent way to showcase handmade items more frequently. My most recent finish is my first self drafted pattern. 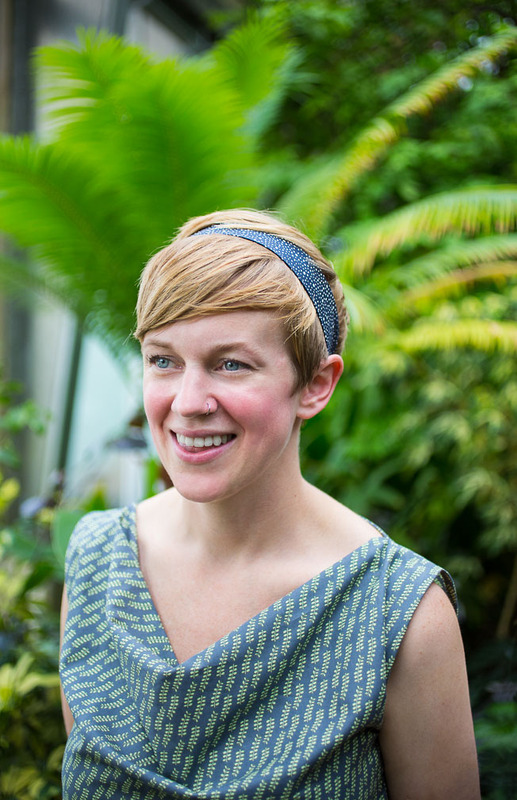 I modeled it after an old store-bought tank top that I love to wear all summer long. It is slowly becoming too worn, so I decided to try my hand at replicating it. This top turned out a lot like my last Bess Top. It is made from a light weight knit fabric on the front with a draped collar, and a really soft lightweight rayon challis by Amy Butler on the back. The side seams are on an angle and I added a small box pleat to the back neck, which I think adds a nice architectural touch. I finished the neck and arm holes with knit binding just like the Bess Top. I am really starting to like that type of finish. Calvin and I had a fun hike in a local nature park to snap this round of photos. And we found these super fun swings along the creek running through the park. How fun? Where would I be without my Man Friday? It was a long winter here in the Midwest, but spring is finally here! And with spring comes Selfish Sewing Week from Rachel at Imagine Gnats and the Spring Top Sew Along from Rae at Made By Rae. I decided this year I would make a Bess Top from Imagine Gnats. I have made one of these tops previously and I love it. As soon as it was finished I was planning to make more. The top is designed to be made from woven cotton fabric, similar to quilting cotton. Making it super simple for a novice garment sewer. Although I will admit the wrap around sleeve it a little challenging. But the pattern includes lots of great pictures which help a ton. The pattern comes with three versions a shirt length, tunic length, and dress. For both tops I decided to make the shirt length, but then decided to lengthen the pattern a bit, so it is probably more like the tunic version. For my current version I decided I wanted to try to use knit fabric for the front of the shirt to make it a little lighter for the hot summer months. I Also decided to square off the neckline a tad. I could not be happier. Calvin and I had a fun late breakfast (*bribe*) and went to a local park to snap some pictures. Birds are chirping, flowers are blooming. It’s gonna be a good year! A coworker of mine brought this lovely quilt top into the office a while back and asked if I would be able/willing to finish it for her. She had recently found it in a family hope chest, and didn’t know anything about it. She assumed it was made by a grandmother or great-grandmother. I told her from the looks of the hand stitching and types/prints of fabrics used it was likely from the 1930’s or 1940’s, and the pattern is traditionally called a trip around the world. I, of course, was more than happy to finish up this beauty for her. I have to admit that although I shy away from this scrappy trip type quilt, I really loved working on this project. There is just something about the smell and feel of an antique quilt. There was no major damage that needed repair and those hand stitches have held up pretty well over the years. So it was straight to basting. I decided on a navy, green, and yellow dainty floral by Denise Schmidt from Joann’s for the backing and a simple warm and natural batting. Where I normally would spray baste a quilt (especially one this size) to get a nice smooth finish, I decided to pin baste this quilt (with what seemed like hundreds of pins – my fingers are still recovering). I was sure it would not hold up well to a machine washing (which I always do to remove any residual spray baste funk). When I started basting I envisioned a traditional Baptist fan quilting design, but as I worked my way out the edges seemed fairly wavy, not to mention the fact that I didn’t think the delicate hand stitching would hold up to all the push and pull of free motion quilting. So, I settled on simple diagonal lines in a dusty green thread. I didn’t use any markings or guides I just eyeballed the center of every other square and went for it. (The squares were fairly small, at around 2”, so it wasn’t too difficult to stay centered). I could not find just the right dusty green to match the outside border of squares, so I settled on a light yellow, which I think turned out really nice. It was even a little hard to give back to Deb once it was done.